Enjoy the Tropical Setting in This Restored Fishing Cottage with Direct Bay front Views! 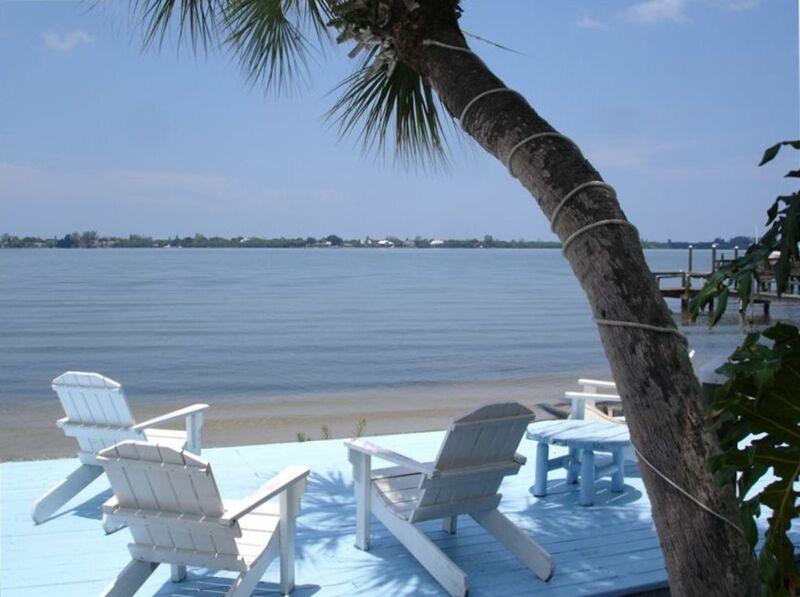 All the Comforts You Want and Deserve; You Will Never Find Another Property with the Character, Views and Cleanliness of This Special Place...Tiki on the Bay! There is central air conditioning and heat. Full Refrigerator, oven and cooktop, dishwasher. Hurricane Irma did not touch the Tiki cottages, we were lucky. A quirky 50's style shower. No bathtub. Tiki is right on Lemon Bay on the Florida intercoastal waterway. We just installed central airconditioning! There is no wifi at our unit at Tiki. You can get 3G or 4G at Tiki. We prefer to keep the “vacation” in our vacation rental. There is free wifi on Dearborn St (close-by) restaurants and library. Just Stack 'Em and Push Start! again if you want to cook! The Easiest Way to Cook! Everything You Need to Cook...If You Really Want to! Coffee maker is provided. A lovely little breakfast room. Full Bay Views from Inside and the Deck; Spacious Deck with Umbrella, Table & Chairs; Bbq Grill; Steps to Tiki Bar & Tiki Hut on Sandy 'Bay' Beach; Fire pit for Campfires! Deck Under Palm Trees to View Sunsets; Fishing Off Dock is Great! Lights on End of Dock for Night Fishing! ; Heated Common Pool; Quaint Small Complex of Units; This Unit Has Best View and All Updated; Tropical Furniture and Setting; You'll Think You Are in the Caribbean! We had a wonderful ten-day stay at the Tiki. From a three-day storm to a Christmas Eve camp fire with other guests which brought warm 80 degree days - we thoroughly enjoyed our stay. We learned that the next-door neighbor is from our hometown area in Illinois and vacationed in the town we now live in WI! Highly recommend this wonderful piece of Florida. We hope to return next year to continue our search for our retirement home! We enjoyed our 2 night stay! So fun to have a door to the patio and beach. Slept more than ever on the comfortable bed. Thanks for all the nice touches in decorating the interior. Good location, close to beaches and within walking distance to a few restaurants and shops. Beautiful views but the property was too small, especially the bedroom and bathroom. Wouldn't stay again. Thank you for your review. Tiki is small. The complex was built in the 1050's which makes it very quaint. All of the units are small. The pictures are accurate and I agree that the bedroom and bathroom are not huge. The view is wonderful and the price is great. This is a slice of Old Florida. This is a peaceful place to enjoy the water and scenery, not to mention the fishing right off the dock. My wife and I each caught 2 fish and released. Thursday morning we went to the farmers market which was only a mile or so away. Very interesting. Beautiful view, cute little cottage, quiet & peaceful! We thoroughly enjoyed our stay! What a cute, little cottage! Just the right size for a week's stay for 2. We loved the beautiful water view and comfortable water-side chairs. We enjoyed the beautiful sunsets, the visits with the manatees and seeing the dolphins swim by. Close to grocery shopping and restaurants, this was a convenient place to stay with easy access to Venice and Port Charlotte areas. We would love to return for another stay! Tiki is very special "old Florida". I am so glad that you loved it. One of the Few Places Where We Have a Fire Pit for that Relaxing Evening Around the Campfire Right on the Water!